March 19, 1865, dawned soft and balmy in central North Carolina. A brass band played the hymn "Old Hundred." The hymn's tranquil strains reminded the 30,000 men on the Left Wing of Maj. Gen. William T. Sherman's Union army group that it was Sunday, while blossoming fruit trees called to mind quiet homes and families far away. Many of the soldiers looked forward to the end of the war, which now seemed imminent. Four years earlier, at the beginning of the war, these men might have remained, untreated, on the battlefield for days. At the First Battle of Manassas in 1861, for example, many Union doctors fled in fear and those who stayed found themselves without adequate supplies or ambulances for their patients. As the war progressed and casualties mounted, however, military surgeons became more adept at caring for wounded. By the Battle of Bentonville, one of the last major engagements of the Civil War, the United States Army Medical Department had developed an effective system for operating field hospitals and an ambulance corps. This improved organization was typical of the advances in logistics that helped the North's war effort. 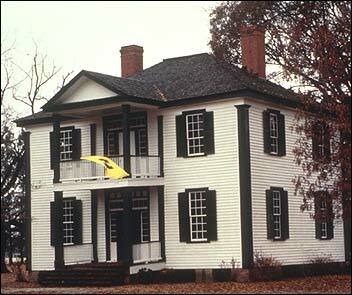 Bentonville's Harper House was quickly overwhelmed by both Union and Confederate wounded; the historic Harper House reflected the typical Civil War battlefield's Medical Treatment for the Wounded.